Register your school for Waste Reduction Week! Your school's waste reduction efforts will be listed on the national website with others from across the country to show that you are making an effort to minimize waste in Canada. Download the WRW school resource kit. This resource will help your school plan Waste Reduction Week activities, conduct a waste assessment, and implement a waste reduction action plan. Download the Waste Free Lunch Challenge kit. This resource is intended to engage and challenge students, classrooms, and schools to reduce their food waste. Register for the Return-It School Program. 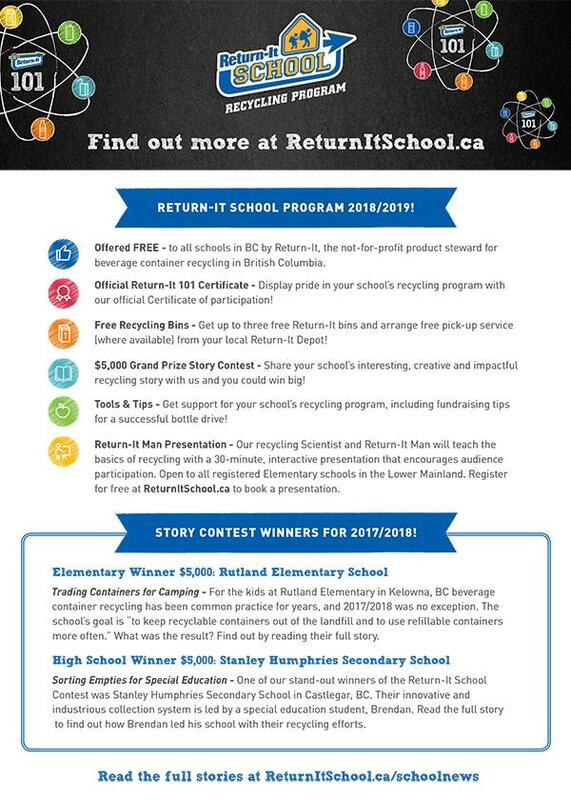 Your school could win up to $5,000 based on for its recycling program, based on its creativity and impact. For more resources, please visit our main Waste Reduction Week page or email us at wrw(at)rcbc.ca for more details. We’d also like to hear about your ideas and initiatives! If you have any special events planned in your community, let us know! RCBC would be happy to publicize these events to our members. For further information on Waste Reduction Week in Canada and a complete list of past events and activities, please visit the national website at www.wrwcanada.com. RCBC would like to invite you to embark on the Road to Zero Waste! This interactive kit is designed as a resource for teachers who wish to incorporate environmental education into their class curriculum. The program includes various activities that teach basic conservation and waste reduction, designed to meet the Prescribed Learning Outcomes for grade 5 students. If you would like more information about the resource, please email us at education(at)rcbc.ca.